What are the benefits of launching your campus app with CampusGroups? Activity Feed: Check quickly what’s going on today. Instantly post news and photos. Share your opinion. Ask questions. Start new discussions. Events: Check out upcoming events, see who's attending, view dress code & other details, RSVP on the spot, conveniently retrieve tickets and receive confirmation. 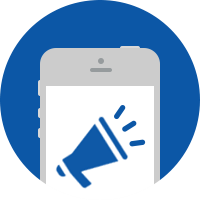 Push notifications: You can send mobile reminders to all or some of your students. Students receive the latest group news and updates (e.g., event location moved). Campus Maps: Upload custom, detailed maps to display the buildings, floors and rooms on your campus, for a convenient way for students to locate and orient themselves on the go. Directory: Browse contacts. Find people in your campus network and communicate directly with them. Chat: Connect and message with your classmates anywhere, anytime. Custom lists: Create item lists for any information, such as FAQs, Locations, Resources, Staff Directory, etc. Web views: Include any of your website pages directly into the app. Social Media: Include your Twitter, Facebook, Instagram and YouTube channels for easy access to your news and photos. Live Polling: Ask questions and request feedback during and after events. Leaderboard: Access your school's Leaderboard to quickly identify the most active students based on earned Involvement Badges (automatically rewarded to students when activity and involvement criteria are met). Your dedicated campus app starts at $99/month + setup. Pricing depends on the number of users and the advanced features you wish to activate (see list below). Please contact us to get started. Call us at (646) 797-3161. Groups: Create a directory of student organizations. Allow student leaders to manage their page, members and news. Allow students to browse, join and interact with groups and student organizations. Find officers when you need to reach one. Email Marketing: Allow any groups to send beautiful emails and newsletters to their members. Allow students to retrieve any email they receive from your student organizations and administrative departments. Event attendance-tracking: Scan QR Codes or swipe student IDs with a Mobile Card Reader. Download attendance data and assess overall campus engagement. Blog: Let student leaders post on their blog. Allow students to read the latest posts from your preferred groups. Payments: Groups can sell membership dues and event tickets online via CampusGroups and collect money directly into their preferred payment gateway (i.e. Cybersource, PayFlow, Moneris, PayPal, etc). Mentoring/Tutoring: Help students harness the power of their network by including access to automated matching of mentors and tutors so they can book available time slots both online and on the app. Stores: Sell food, drinks and merchandise directly from the platform. Track sales details and generate insightful reports on collected data. Budgeting: Access and collaboratively manage your accounting and budgeting process at any time. Checklist/To-Do Lists: Review student participation data pulled from attendance tracking information to know at all times whether students are satisfying mandatory requirements and meeting checklist goals set forth. Mobile app adoption is key, and it does require a bit of marketing on campus. Fortunately, there is no need to design your own Mobile App flyer -- we do that for you! CampusGroups automatically designs a flyer for you and lets you download it. You can even edit the content of your flyer with custom slogan and instructions. Look for the "Promote" button in your app builder. Know someone interested in building a campus app? Be sure to let them know by entering their email here. Admissions: How can CampusGroups boost applications, accepts and retention?